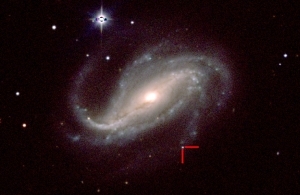 Observations of supernova "SN 2016gkg" taken with the Katzman Automatic Imaging Telescope (KAIT) at Lick Observatory. 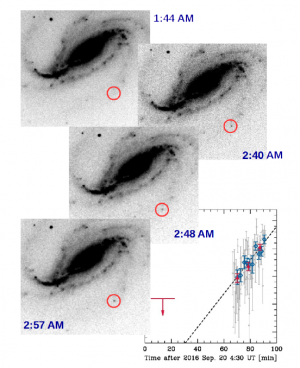 Maunakea, Hawaii – Thanks to lucky snapshots taken by an amateur astronomer in Argentina, scientists have obtained their first view of the initial burst of light from the explosion of a massive star. CREDIT: V. BUSO, M. BERSTEN, ET AL. Sequence of combined images (negatives, so black corresponds to bright) obtained by Víctor Buso as SN 2016gkg appears and brightens in the outskirts of the spiral galaxy NGC 613. Labels indicate the time each image was taken. The object steadily brightens for about 25 minutes, as shown quantitatively in the lower-right panel. 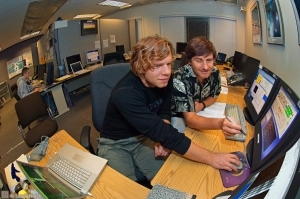 CREDIT: © LAURIE HATCH Co-author Alex Filippenko, a UC Berkeley astronomer (right) with UC Santa Cruz Assistant Professor Ryan Foley (left), both of whom are longtime W. M. Keck Observatory users. CREDIT: C. KILPATRICK (UC SANTA CRUZ) AND CARNEGIE INSTITUTION FOR SCIENCE, LAS CAMPANAS OBSERVATORY, CHILE Supernova 2016gkg in spiral galaxy NGC 613; color image taken by a group of UC Santa Cruz astronomers on Feb. 18, 2017, with the 1-meter Swope telescope. 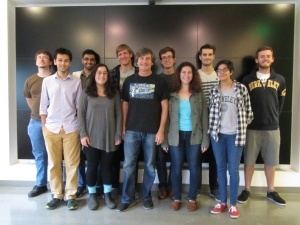 CREDIT: A. FILIPPENKO Co-author Alex Filippenko (center) and his team included undergraduate students at UC Berkeley who helped research and monitor the changing brightness of Supernova 2016gkg.